1) The ability to create up to 25 sites in your account. 3) Total storage of 5GIG per site and 125GIG for your account. 4) The Yola Link removed from any free style you use in your account. 5) One Premium Style credit. This credit can be used for all the sites in your account. 7) Credits for services from iStockphotos, Facebook Ads Trial and Yahoo Search. As an existing user: please take note that if you are over the site or storage limit none of your sites or files will be lost! You will be able to keep everything as part of your free account. However, should you require additional sites or storage you will need to upgrade. As always the Yola staff are on stand by to receive your feedback and answer any questions you may have. As I can understand everybody's frustration (yes I am a little disappointed myself) but does anybody here actually know what it cost's to run their own website with their own server and hosting? Remember bandwidth is very expensive and it can rack up fast if you have many visitors. To host on a server it can run anywhere from $99 a month and thats just ONE month of server use let alone other expenses and sometimes bandwidth overuse. I have found a server host that does it for $99 a month and it's just 2 GB and Yola offers 1 GIG per site. That isn't bad at all. If you are thinking about moving to Freewebs or something similar, for their free version, there is ads. For their cheapest premium it is $50 a month and it's 5 GB for one site. So yes you may be disappointed in having to limit your site and everything else. I myself cannot afford to by the Pro because money is tight from a big purchase earlier this week. I do ask everybody here to stay with Yola. Because hopefully if we start giving them a little bit of money, they might start giving us some new features that we desperately want. Don't bite the hands that feed you. Myself and a few others off the top of my head are probably the only ones that can build a membership database. With the uploading of the html, js and css files we will be able to have the membership database's and I will start working on one. I will share with anybody that wants it as long as the credits remain intact. But we will work over that bridge when we get there. But please, give Yola a break. I'm sure they have a bigger expense monthly than they do income. I've said my 2 cents. I don't mean to offend anybody and please don't take it the wrong way. I'm confused. Free Yola has unlimited bandwidth and unlimited number of sites but you charge to limit those things? Yes that is sorta correct. As of the olden days we could upload to our hearts desire. But now uploading is limited to 1GB a site. The pro deal is 5 GB upload per site and each file can be up to 100 MB. Does that clear things up? are you kidding me? With free yola we are now limited to 1GB? If that's the case I'm gonna have to find me a new site builder because 5GB isn't even enough. 5GB's is huge! The average size of brocher type websites is about 1mb or 2mb, and some are even under a mb. I would say if your website starts going over 10mb's it's time to start optimizing. With the pro pkg, is it possible to have a page that is a pdf file. That is, when a person goes to that page they see the pdf file (doc) WITHOUT downloading it? I guess what I'm asking is, is it possible to host a pdf doc as a webpage -- with a direct link to that page (with the pro pkg)? You can try using this line of code. That is correct. You can do this with a free or a pro account. PDFs are not a restricted file type and anyone can upload one. The embed code lambofgod has provided should work if you want to embed the PDF in your page. can you do that with any document? word, excel, pdf, etc.? Um I just tried it with word and had some displaying problems. It kept saying I needed to install a plugin but wouldn't tell me which ones or would install it at all. Also a change to the code!!! when you tried it with word, did you use the .doc or .docx extension rather than the .pdf? Oh good point, the only word doc I have at the moment is in RTF format, will try with regular. I just tried it with .doc and .docx with the same plugin problem. I may be doing something wrong and I will admit it but doesn't seem to work with word. Have you tried with pdf? See the tiny green line? That is how much you have used. When you reach 1 GIG let me know and we can talk again. 98% of our customers are nowhere near the storage limit, and the ones who are have the option to get more storage. although it might take a long time to get 3,048,000 articles (wikipedia's current count). lol as much as I enjoy your goal (I want to be as big as them too) it will never be possible to host a website like that on a web based site builder. If I remember correctly in 2007 wikipedia had about 106 servers. But it's a professional site with many people working in the company. But one day if you get big enough you may have your own servers :D we can only dream until it happens!! Great answer lambofgod! Thank you. Actually, 6.57 MB of 1024 MB is 6.42% used. Based on having 158 pages currently. If the average maintains the same, I'll only be able to have approximately 2,461 pages (which is not a lot) because 158 is 6.42% of 2,461. Wow... and then multiply that by 5... you're only looking at a possibility of 12,305 pages give or take a few. For my vision, I can't stop at 12,305 pages. What's a good option? Is the limitations for each website or all websites you have? why did yola take away its unlimited stuff? Donald seriously my friend... ;) By your own math and with as long as you have been a member here with 158 pages built... It would take you 11 years to use up the 1 GIG and complete a 2461 page site yourself. Now that's thinking a little too far advanced D... LOL You got an additional 58 years or a team of elves for the 12,305 pages? Can we give YOLA the credit and kudos they are due for allowing us to use their servers and site builder... They simply asked that those of us who have large sites help pay for them. That in itself is reasonable and worth the extra $4 dollars a month expense. you think so? Actually... it took me 5 months to get 158 pages. So it would actually take me 6 1/2 years - ON THE CONDITION that I don't speed up my pace or find a friend or two that wants to help me. Right now I get distracted a lot with other stuff. I figure only about 4 hours a day is spent on my site, I hope to be able to increase that to about 10 hours a day 7 days a week in hopes of having a good website with good traffic and hopefully good revenue. If I go from working 28 hours to 70 hours a week. Instead of 6 1/2 years it will take me 2 years and 7 months to fill up 1 GB. This is again, if I don't enlist some help. I figure it shouldn't take longer than a year to fill 1 GB. Donald my boy I love your spirit... Keep it up. I like Ed's idea so much that I am going to send you some of my Elves this year to help you along... Here is a hard worker who loves the internet. Lol, I have no problem paying for the pro after I get big enough to need it. I was just saying, WHAT IF!!!? Am I going to have to cease my site operations after some period? After all, it took wikipedia 8 years to reach the 3 million articles point... why can't I do the same? You think in a while (like 3 or 4 years down the road) Yola might be able to offer more than 5 GB... even if in fact it's expensive? @Santa Claus. Fantastic! Can you send me one of those two elves to help me answer all my emails! The one on the right seems to be slacking off and I could find some work for him. I think I am in more danger of reaching 3,048,000 support requests than Donald is of running out of storage space! Donald, it sounds like what you have going on is much more that what Yola can handle anyway. It's free web hosting and we have no limits on how many people can view the site, we are saving a lot of money just in that. I have a 199 pages and I am barely making a dent in my file storage. Good luck to you in what you have going on, all the best to you. does any site builder limit how many people can view the site? I would think this would be impossible to limit? ok :) I'll try what I can... I'm not about to stop or start my project all over. I just hope it doesn't come to an end. LOL! I am guessing that the file storage is 5MB PER SITE? And we get 5 sites with free yola? and 25 sites with pro? If the sites are linked together to continue creating the same site with a slightly different url (same layout and everything) then we would have 125 GB with Pro? and 5 GB with Free? If this is the case, then things might work out. That would allow for 307,625 pages approx/average for PRO! It might take me an extra year to get that many! LOL! I'm completely floored. This will really change my business plan as a website designer using Yola to build websites and offering free unlimited storage and bandwidth as part of the incentive to buy from me. This is quite unexpected especially in view of the article posted Sept. 8 on Mr. Lingham's blog and I quote: "we decided from the very beginning that we wanted to create a business where the basic services are all free (website hosting, free site building software, free bandwidth, and no advertisements) and we charge our customers for add-ons and other value added services (domain names, premium styles, subscription packages for extra features – coming next month)." The limitations placed on the free service is very unexpected!! I was expecting that the extra features would be what would have to be paid for not the storage and bandwidth. In another part of the same blog post, Mr. Lingham said, "Well, for starters – hosting is absolutely free – why charge for something that doesn’t really cost us much –" So why are you?? Yes, charge for extra features but don't take away the storage and bandwidth and also do not limit the number of sites! Very good question. I think some clarification is in order. Yola does not charge for hosting or bandwidth. Even our free users get unlimited bandwidth and unlimited hosting. To clarify: Hosting refers to PUBLISHED sites. Once a site is published, any files that are stored there are never removed and not metered (You can have unlimited traffic and usage of the files that are published). However, there are some costs involved with storing large amounts of files that are in the file manager and are not used often. For example, you could use up you 1GB free limit to build your website using Yola Free and if you wanted more space, you would simply delete old files in the File Manager - they will not be removed from your website. I hope I'm making it clear? The limits are placed on storing files - not the use of them on your pages or the use of them once your site is published. As you can imagine, there are many people who try to abuse Yola's services and have been storing large amount of files which they never need or don't use. These limits are also in place to protect us. The reality is that 98% of our users don't even reach these limits. Yola has everyone's best interests at heart and we're trying to build a sustainable company that provides both a high quality free and paid service to all Internet users. I personally value all your feedback - so please keep it coming. ok, let me get this straight. So the 1GB and 5GB limit only refers to the file manager? So the text and pictures pasted into a text widget don't count towards this limit? If I'm understanding this correctly, then I have no issue. Most of my storage IS NOT in the file manager... I very rarely use the file manager. hey, someone that understands. Can't yola make enough money without having to limit bandwidth? I invite you to take a look at the alternatives. Our free offering is extremely competitive, as is the pro version. We value our customer base, and no one is going to suddenly get anything less than they were using yesterday. We are still the same company, with the same commitment to excellence and value. To be able to continue being that company, we have to make some considered choices, and in that process present you with some. At this point you get to choose between Free and Pro. Either way, we remain dedicated to providing you with your choice and supporting you every step of the way. Your clarification is much appreciated! I'm relieved that I can still offer unlimited bandwidth as part of the package--I will have to do some updating of my services page though! As far as the storage goes, I understand your reasoning but going from unlimited to 1Gb is kind of a shock to the system. Although I optimize images for the web as much as I can, images as well as video can eat up space more than you think--especially doing special event websites for weddings, graduations, anniversaries, etc. Maybe 2 or 3 Gb would be better. All in all I'm going to have to rethink pricing, packages, etc. i have seen free host that have 5 gigs FREE! And they even support PHP and what not. Hosting is something that we provide for sites built using Yola, and we provide unlimited bandwidth along with that. Our offering is however far more holistic than that of basic hosting companies - we provide the tools and support to build and grow your websites. As I said, it is all about choice, and feel free to make yours. If you are concerned about how close you are to hitting your limits in the free offering, you can view your status by logging in and looking at your Account Status. Most of our users are way beyond any limits of the free offering. Yola definately has better support and tools than any website creator out there. More user friendly too. They sometimes frustrate me with some of the changes (after all... how can you get use to something when it's always different lol)... but try creating a site with another site creator... OMG, it's impossible. Even with the site creator I purchased from the store a long while ago. The thing is not user-friendly. They should say, "Masters Degree in Web Design required to use this software." Would appreciate more info on the upload html feature. Does this mean FTP access with whole page uploads using something like Dreamweaver? Excellent question. No, the HTML feature does not offer FTP access. You can upload a file with a .html extension to your resources folder and reference this file through a link or embed code. It is not the same as uploading a website or webpage built elsewhere. You still need to use our site builder to create your pages. I would just like to offer my support to the Yola team. I think its a good thing that they are allowing a pro account. I too am a web designer and encouraging my customers to control their own sites. Having the different features is a great thing for me. To all those who are moaning for the storage space and site space, please stop been so tight fisted, I completey agree that Yola needs to earn revenue too, just like you and me need to. These people work exceptional hard to give us this opportunty to be able to make your own sites. Yola has my full support. Thanks Emma! We really appreciate your support and understanding of what we are trying to achieve for all our customers. I have 2 paid domains here and am not a programmer so I am very thankful for the site builder. You people that are complaining need to understand that yola needs to make money too, some of you are the same people who ask about adsense and monetizing your site but are too selfish to give other people that same consideration. you are in pages per site and what you pay per month compared to yola, total what you would pay per year over there compared to yola's pro package and see if you don't come running back. I for one am very grateful for Yola and especially their customer support, they are quick to help with any problem you have and value their customers. I LOVE YOLA!!! I can stop worrying about my first rather panicky response to the changes - it was pretty mild compared . . . ! I still think the first email/notification could have been more clearly worded and provided more details - it all seemed a bit peremptory. Now that I am seeing things a bit more clearly, which is fairly easy since my site-building and hosting needs are very basic and simple, I do have one complaint! I realise that a Pro site compulsorily loses its Yola footer. Now - I would like to keep a Yola logo on my sites, so that those who visit can get a link to Yola if they like what they see. I know I can easily insert a link to Yola (I've done this on sites with other services I pay for, and they even kindly provided nice links to use), but it would be nice if Yola too could give us some interesting logo/link things to insert on our sites. How's that for an idea? Please keep working on all this - everything will get clearer and better, I'm sure. Toucharin - I am sorry you feel this way. Just to clarify, the charge of US$19.95 is for buying a domain name only. This amount is for one domain for one year (you can choose to purchase more domains for more years). If you elect to use this option you become the owner of that domain. There is no charge for publishing or hosting your site. When it comes to individual file uploads, you can upload individual file uploads of up to 15MB with the Free Yola Account. 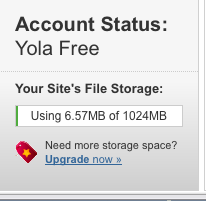 For the individual file uploads of up to 100MB you need to purchase Yola Pro. I am a bit disappointed in some of the Yola, site building users... I don't understand how One could possibly create a site for free (whether paying for a domain or not) Using Yola, Start a business on this FREE site, and expect to receive money from Customers, That they would Not have in the first place if it was not for Yola. And then Not understand that Yola is a BUSINESS too, How can anyone be upset that Yola is trying to make a little bit of money to keep the business going. If Yola did not exist, Our Free sites would No Longer exist either CORRECT?? Plus, Yola is not Forcing ANYONE to buy the Pro Site.. it is just an option that is out there. How many of you that are complaining about this Pro site have items for people to purchase on your websites? Seriously. Yola doesn't need people Yelling (writing in all caps) at them for trying to keep all of their customers happy... I can understand some of the concerns that some have, but do we seriously need to write in all caps, or criticize Yola and Staff? I know this is just the internet, but i have honestly lost respect for Several of the Yola users within the past few days. I know this has been said many times, but i also want to add that i am Completely and totally 100% happy with Yola, and i Support everything that Yola is trying to do for their customers. I am So glad that i have found a company that will listen to their customers and use ideas from their customers to make Yola Better. I honestly hope that my Future customers will be as happy with Me and My company as i am with Yola. Thank you So much TO All Of the Yola Team! Thanks Savannah!! We really appreciate your support! Thank you as well for understanding what we are trying to achieve for all our customers.